Wow! Its Really Amazing. 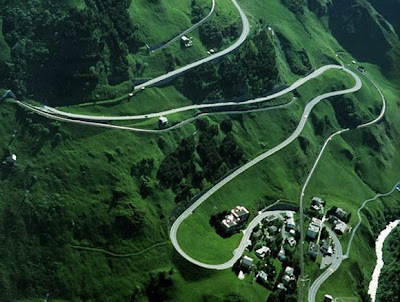 Here is a list with the Most Beautiful Roads in the World to drive on and another five honorable mentions that you’ll surely like. Enjoy! The greatest driving roads in the world should have a perfect mixture between challenging and complicated bends, long fast straights, little to no traffic and especially breathtaking views! These roads might have enough twists and turns to give you a headache but you’ll feel incredible after you’ve conquered them and you’ll surely want to try it again and again and again. 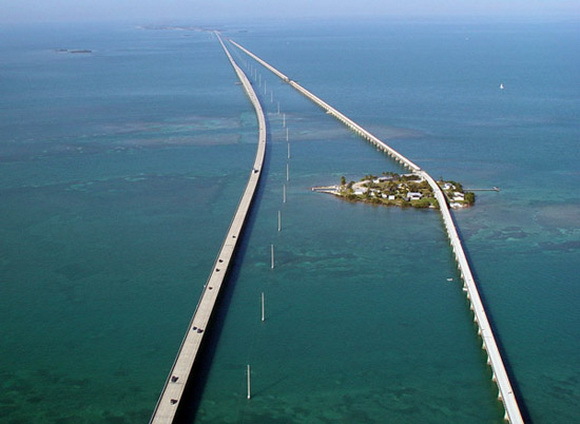 The Overseas Highway – Florida Keys. 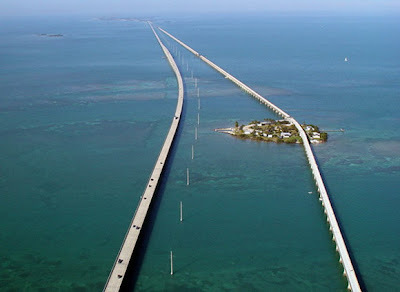 The Overseas Highway leaps from island to island across 42 bridges southwest through Florida Keys and it was built in 1938 along the course of an old railroad that has been destroyed by a hurricane. The highway is mostly over water and in about four hours you can enjoy the beautiful scenery and the ocean and of course, the incredible sunrises and sunsets if you come here at the right time. During holidays the traffic will make journeys through this highway a bit longer but I’m sure everyone would love to stay on this road as long as possible. 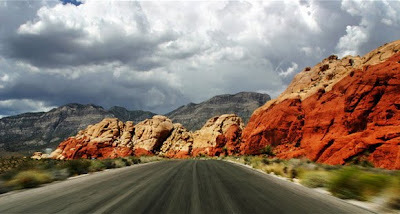 Red Rock Scenic Road – USA. The Red Rock Scenic Road winds through Sedona’s Red Rock Country, often called a “museum without walls”. 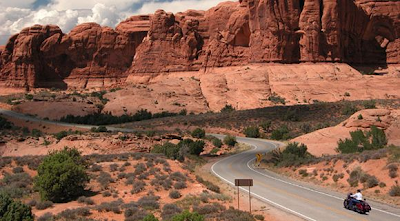 The road provides a splendid view of the stunning red rocks which seem alive like a timeless spirit that captivates and inspires everyone. The Red Rock Scenic byway also passes through the Montezuma Castle National Monument and the Coconino National Forest giving every driver an amazing sense of intimacy with nature. 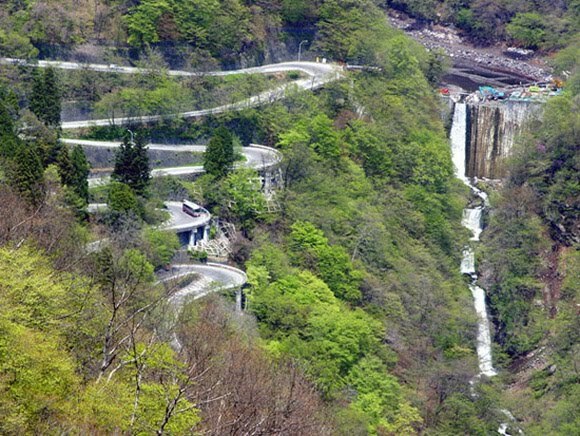 Iroha-zaka is a winding road from Japan which connects central Nikko and Oku-Nikko. The road comprises of 48 curves and each corner has an ancient Japanese alphabet, starting in alphabetical order from I-ro-ha which also gave this road’s name. Iroha-zaka is actually made of two roads, one to come down and another to go up and they both have 48 curves matching the 48 letters of the ancient Japanese alphabet. 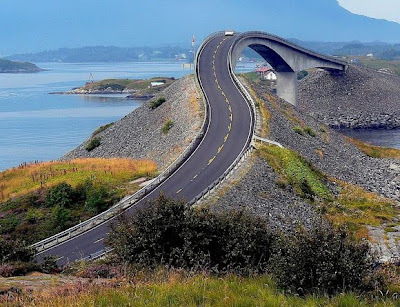 The Atlantic Road was voted as the Norwegian construction of the century and it’s a five mile long stretch of road connecting Molde and Kristiansund in this country. 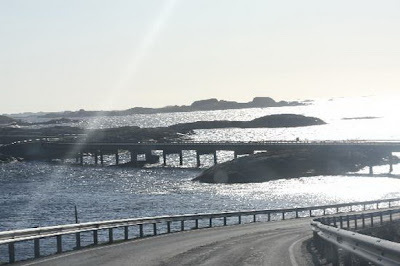 The road rides above some rough and uneven surfaces and it’s spectacular because it rises itself and falls at many places like a sea at the time of a rough tide. Apart from the incredible road itself, the scenery surrounding it could give any driver shivers. The Oberalp Pass in an incredible road in the high Swiss mountains that’s an important link between Central Switzerland and the Graubunden Oberland. 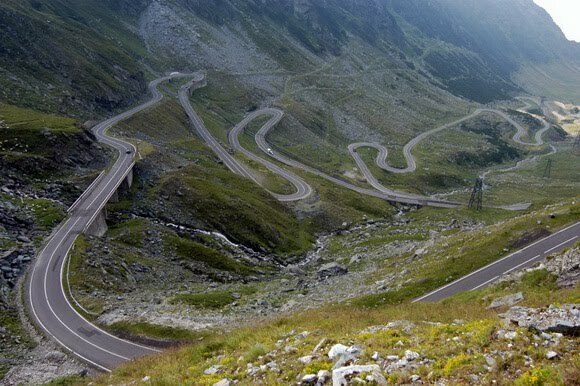 The road is really popular for all drivers from Europe but it’s only open during summer months. In winter this pass is closed for road traffic and the road itself is used as a ski slope, toboggan run and hiking trail! North Yungas “Road of Death” – Bolivia. 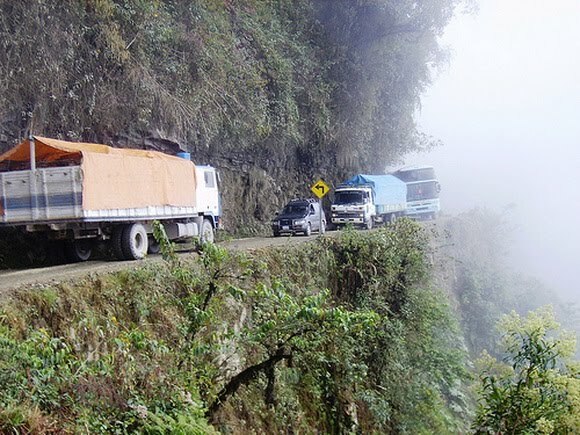 The North Yungas Road is a 43 mile road connecting La Paz and Coroico deep into the Bolivian Andes. 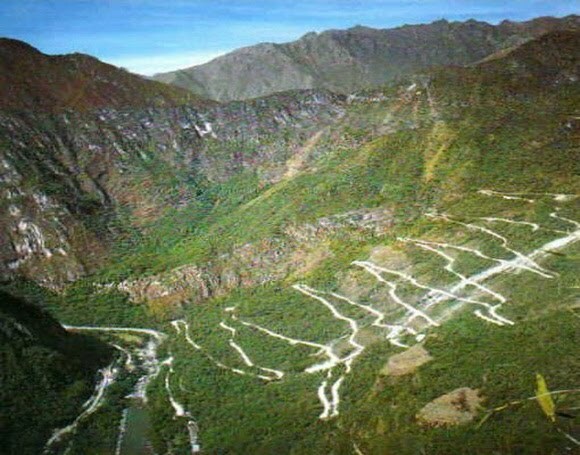 The road is name by the locals “El Camino de la Muerte” or the Road of Death and it was named the world’s most dangerous road in 1995. 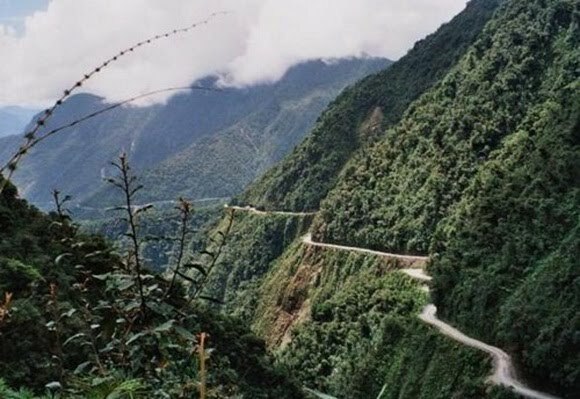 The road, famous for its extreme danger has a single lane width with terrifyingly drop offs, tight hairpins, narrow passages and almost no guardrails at all. The fog and rain can make visibility poor and the road surface muddy which adds even more dancer to any journey on this road. On average, there is a fatal accident every couple of weeks on this road and it is estimated that 200 to 300 travelers are killer per year on this treacherous road. Today however, the Youngas road has less traffic and it used mostly by travelers who want to feel its thrill. 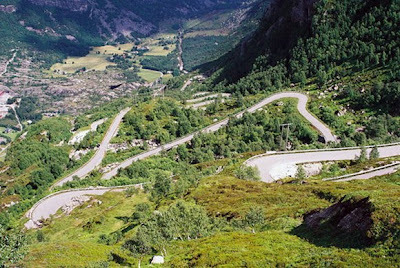 One of the most notable attractions from the Fjord in Norway is the Trollstigen road, a steep winding mountain road located in the Rauma region. The word Trollstigen means the Troll Ladder in English and it represents a series of stunning roads with a breathtaking view and a couple of incredible waterfalls. This road is very narrow and leaves very few possibilities for vehicles to pass each other and with its steep 9% gradient and 11 hairpins it’s really, really challenging. 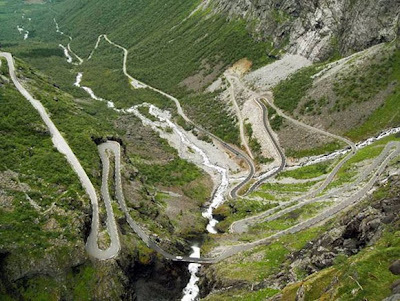 But it’s all worth it if you get to the top where you’ll see this amazing road from above and the Stigfossen waterfall, a 320 m waterfall which falls down the mountain side. Guoliang Tunnel Road – China. 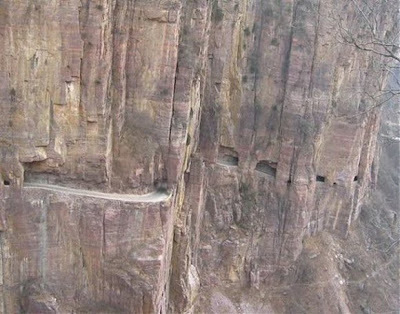 The Guoliang Tunnel Road was built by 13 local villagers headed in only five years in the Taihang mountains in the Hunan province of China. Many villagers lost their lives in accidents during the construction of this tunnel but in 1977 it was opened to traffic. The tunnel carved from the mountains is 1,200 meters long, 5 meters high and 4 meters wide and its also one of the most dangerous roads in the world. This extremely beautiful scenic route was dubbed as “the road that does not tolerate any mistakes” and its a key destination on the Chinese tourism map. 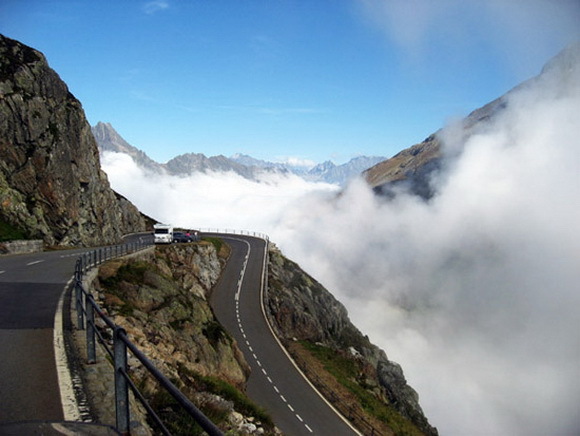 San Bernardino Pass – Switzerland. Another high mountain pass across the Swiss Alps is the San Bernardino Pass and the road that goes through it and connects the Swiss towns Misox and Hinterrhein is also one of the world’s greatest roads. The pass is located at 2,065 meters and the road has incredibly smooth roads, a lot of hairpins and challenging bends and of course, amazing scenic views. 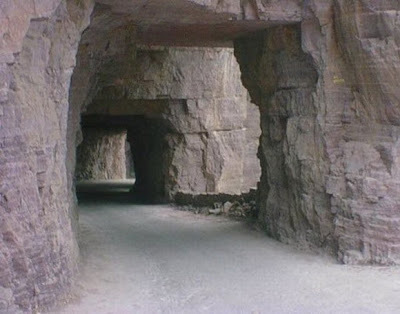 The road also goes through an impressive 6.6 km long tunnel. Los Caracoles Pass – Andes. 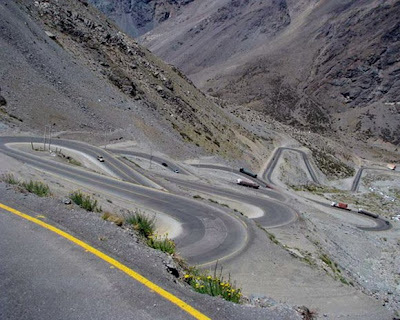 Los Caracoles Road passes through the harsh terrain of the Andreas Mountains from the Andes on the way between Chile and Argentina. 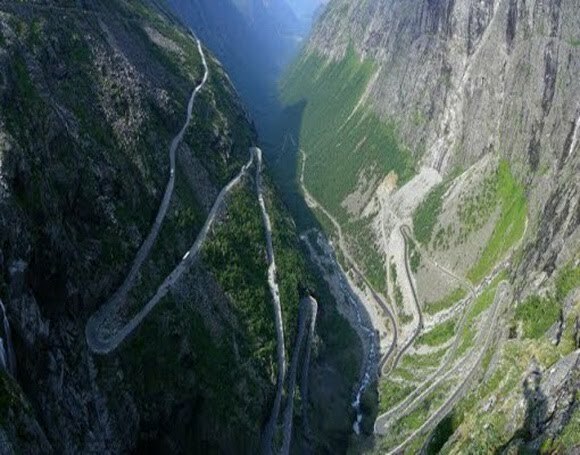 The road has many hard switchbacks on an extremely steep incline and numerous hairpins without any safety guard rails. For the most part of the year, this pass is covered by snow and that makes it incredibly hard to negotiate. 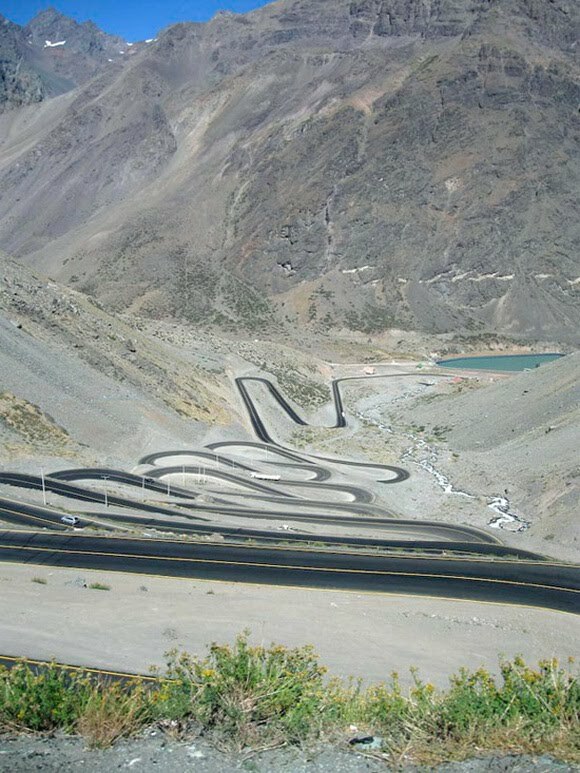 Despite the fact that it’s one of the most challenging roads in the world, the Los Caracoles Pass has a strong safety record. 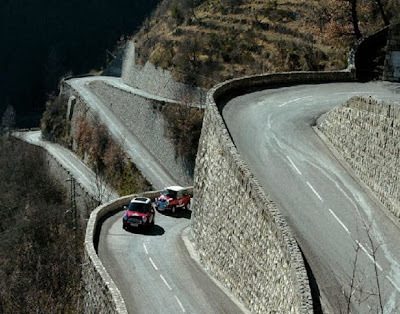 Col de Turini – France. 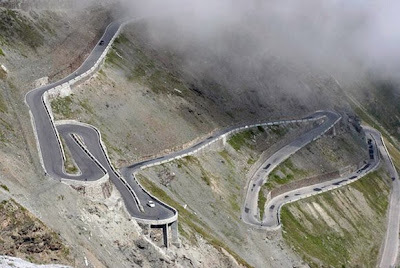 The Col de Turini is situated in a mountain pass in the south of France in the Alps at more than 1 mile above sea level. The road is included as part of a 20 miles rally stage every year of the Monte Carlo Rally in the World Rally Championship and it combines 34 hairpins and long stretch lines where cars can reach top speeds of over 110 mph. This stage is one of the most challenges stages from the WRC and apart from the wonderful road, the scenery also makes it one of the Most attractive and exciting roads on Earth. 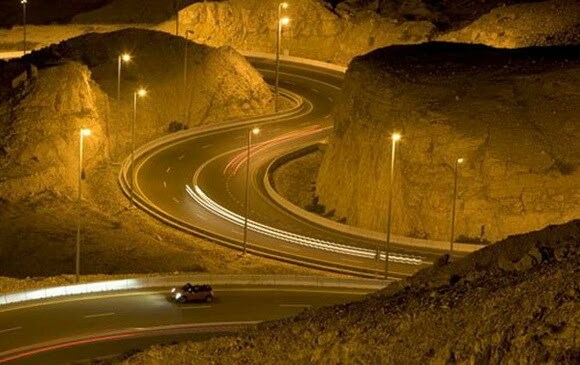 The Jebel Hafeet Mountain Road – UAE. 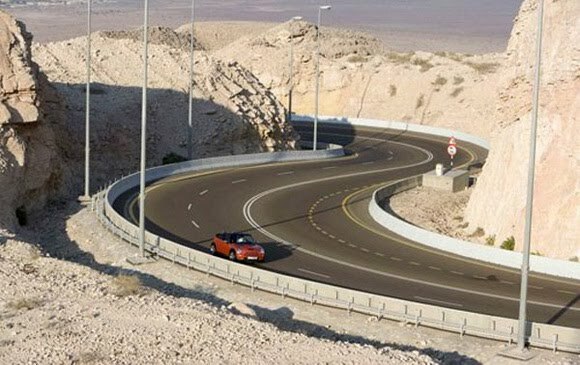 The Jebel Hafeet Mountain Road in the United Arab Emirates extends for 7.3 miles with 60 turns up the mountain of a height of 1,219 m. The UAE road scales the mountain with a beautiful view of the desert below and ends at a parking lot with only a hotel and of course, a palace, belonging to the country’s rulers. 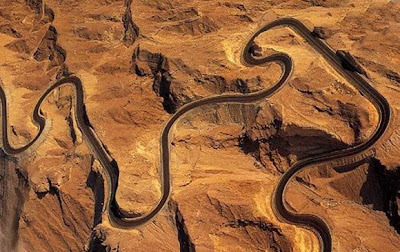 The road is a mixture of fast straights and sweeping curves that merge perfectly from one to another forming this amazing driving road in the middle of the desert. 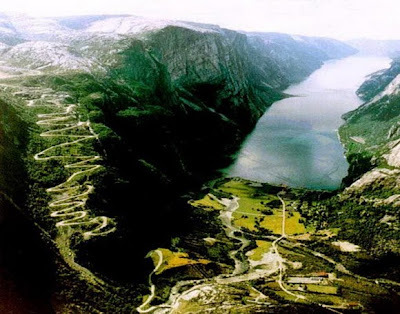 The Lysebotn Road is considered one of the most breathtaking roads in Europe and it all starts with the narrow road up the steep walls of the Lysefjord, Norway. 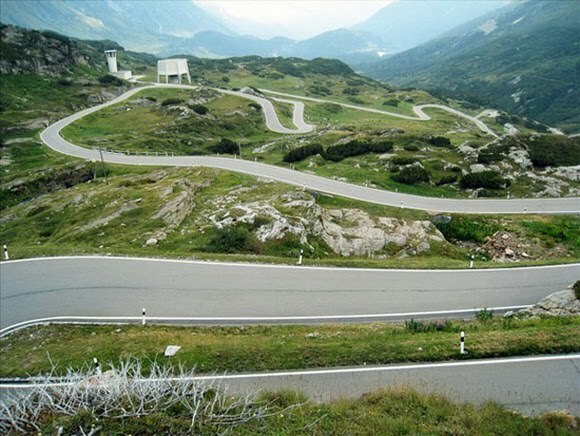 The road includes 27 challenging hairpins and a 1.1 km long tunnel at the bottom which also has 3 switchbacks inside to make things even more interesting. 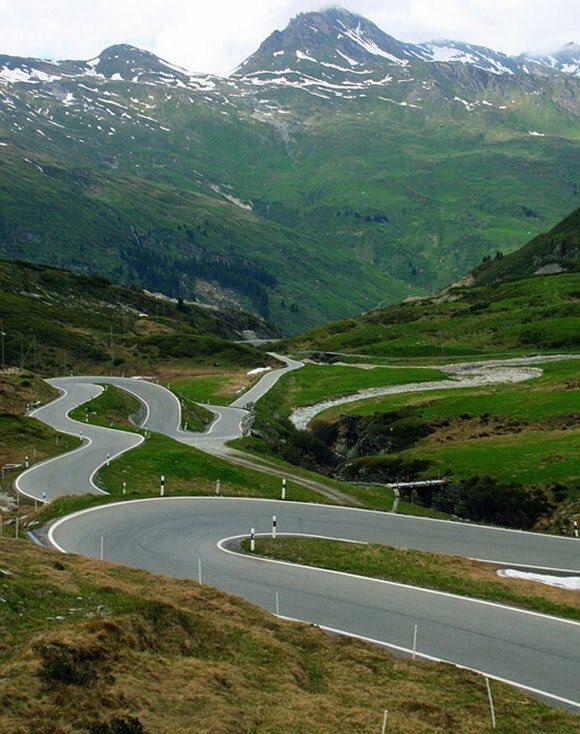 The surface of the road is perfect and the ones who were already on this road think of it as a rollercoaster. It’s probably the most fun road from Norway and its last 30 km to Lysebotn will put a smile on every driving enthusiast’s face. From the Eastern Alps in Italy, the Stelvio Pass Road connects the Valtellina with Merano and the upper Adige valley. 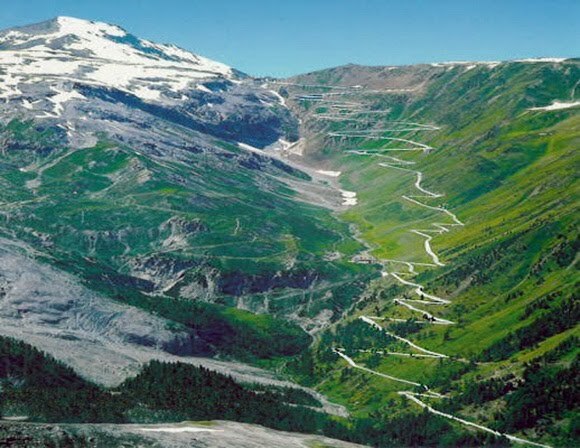 This is the second highest paved mountain road in the Alps and its situated at an altitude of around 1.7 miles (about 2,757 meters) above sea level. 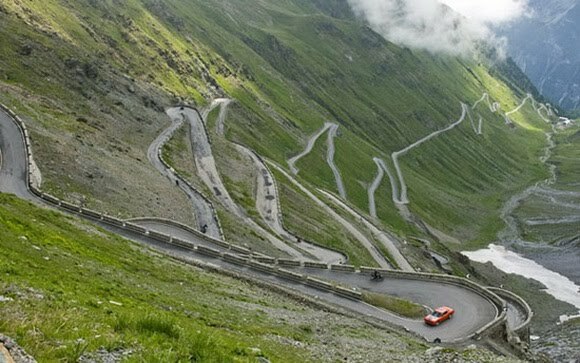 The Stelvio Pass is one of the best continuous hairpin routes in the world and its fame came from the presence of 48 hairpin bends and the fact that the road becomes very narrow at some points and it has a couple of very steep inclines. This road is regarded by many car enthusiasts as one of the most challenging roads in the world and it’s scenery is absolutely breathtaking and spectacular. 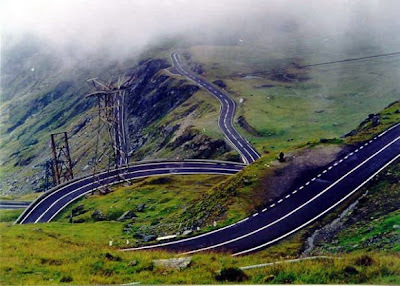 The Transfagara?an (that’s the exact spelling) is the highest and most dramatic paved road from Romania. Built as a strategic military route by the former dictator Nicolae Ceausescu between 1970 and 1974, this road connects the historic regions of Transylvania and Wallachia, and the cities of Sibiu and Pitesti. 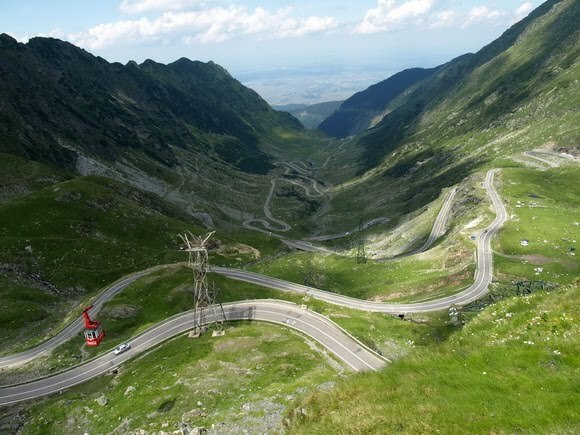 The Transfagarasan represents 90 km of twists and turns run North to South across the tallest sections of the Carpathian Mountains between the highest peaks of the mountain in this country. On top of the mountains this road provides access to Balea Lake, a glacier lake which has been here for thousands of years and it also has an almost 1 km long tunnel straight through the mountain’s top. The road was built at a high cost both financially and from a human standpoint with more than 6 million kilograms of explosive being used on the northern face and official records of 40 soldiers who lost their lives while building it. Unofficial records however mention that only the tunnel took about 400 lives. 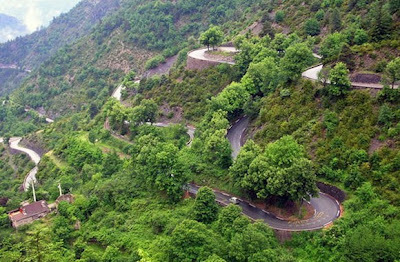 The north end of the road is the most spectacular and it’s dotted with steep hairpin turns, long S curves and sharp descents combined with an absolutely stunning view! Between October and June this road is under the snow and usually closed so… that means only a couple of months in the summer it’s available to enjoy a pure driving pleasure. Top Gear also named this road as the best road in the world !